Process Spectroscopy Market size was valued at over USD 800 million in 2015, and is anticipated to grow over 6.5% CAGR from 2016 to 2024. Process analytical technology (PAT) is a mechanism that designs, analyzes, and controls manufacturing through measuring parameters that affects critical quality attributes. Food and Drug Administration (FDA) formulated the PAT framework with an aim to ensure high quality performance. This has led to adoption across U.S. pharmaceutical companies. Regulatory bodies across the globe may implement such policies over the forecast period. U.S. process spectroscopy market size is expected to witness potential impact of this framework over the next eight years. Companies are focusing to reduce variable expenditure by minimizing the re-work and errors. This equipment enables monitoring and control effectively & efficiently and also checks quality, which in turn will drive process spectroscopy market share over the forecast timeframe. Increasing competition has led to companies lowering the price and raising quality to gain competitive advantage. Growing awareness regarding importance of these devices among industries is forecast to drive demand. Companies with ineffective process control face numerous problems such as high production and inventory time, visual defects, which is likely to hamper brand image. Effective implementation offers benefits such as consumer satisfaction, low production cost & inspection cost, efficient utilization of resources, and increased sales. High capital investment coupled with deficiency of skilled labor will negatively impact the production rate. Emergence of cost effective technologies is anticipated to lead in price reduction. Timely consultant intervention is predicted to smoothen the integration process and ensure the best possible return on investment. 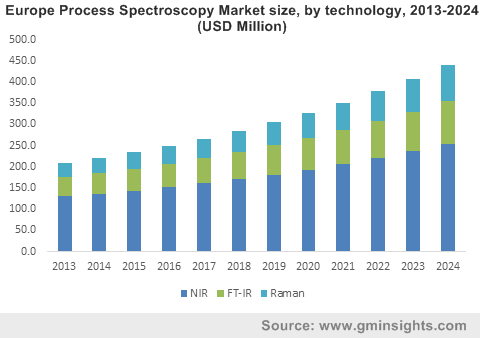 NIR technology segment accounted for over 60% of the overall process spectroscopy market share in 2015 and is likely to grow at over 6% CAGR from 2016 to 2024. Growth in the sector can be attributed to rising application in numerous sectors such as quality monitoring, food industry, biogas plants, plastics identification in chemical industry and controlling paper production. Fourier Transform Infrared (FT-IR) was valued at over USD 170 million in 2015 and is projected to account for over 20% of the overall industry share by 2024. Escalating use of this technology in identification as well as assessment of numerous materials, chemicals & compounds such as particulates, residues, fibers, chemical warfare agents, pesticides and narcotics may propel industry demand over the next few years. Presence of key industry participants and stringent quality standards in pharmaceuticals, healthcare, and food & agriculture sector is expected to fuel U.S. process spectroscopy market size. Asia Pacific revenue share will grow at 8% CAGR from 2016 to 2024. Industry participants are increasingly relocating research and development along with manufacturing activities owing to presence of cheap labor and resources to reduce cost. This is expected to primarily contribute to regional growth. Rising awareness regarding quality products and standards among people is likely to force players to adhere to guidelines of international quality standards. In order to improve brand image, companies have started implementing quality measure to gain these certifications. These quality measure is predicted to offer benefits such as improvement in product quality, process effectiveness, and cost saving. Key players contributing to process spectroscopy market share include ABB, Agilent Technologies, Bruker, Buchi Labortechnik, Danaher, Foss A/S, and Horiba. Other prominent industry participants are Kett Electric Laboratory, Sartorius, Shimadzu, Thermo Fisher Scientific, and Yokogawa Electric. Industry players are focusing on development of instruments and solutions that are capable of providing FT-IR and NIR into a single device. Bruker Corporation has developed MPA, which is a multipurpose FT-NIR analyzer. Thermo Fisher Scientific is estimated to be the key player in the market; its offerings include reagents, equipment and consumables, analytical instruments, and software and services for research, analysis, manufacturing, diagnostics, and discovery. The company has four operating business segments, specialty diagnostics, laboratory products and services, life technologies business, and analytical technologies. Companies such as 3M, Boeing, General Electric (GE), Hewlett Packard (HP) and Lockheed Martin have successful implemented Six Sigma. Governments worldwide are anticipated to lay down strict quality policies for manufacturing in order to get enhanced products. Manufacturers may design their own product or assemble components to produce the final product. Some leading players are Agilent Technologies, Inc. Thermo Fisher Scientific, Inc., and Danaher Corp. Manufacturers also offer customized solutions for their customers along with analytical software for data storage and analysis. Thermo Fisher offers GRAMS Spectroscopy Software suite to collaborate data sets and perform analysis on these data sets. Near Infrared (NIR) spectroscopy is anticipated to be largest technology segment over the forecast period. However, Raman spectroscopy is expected to show high growth rate owing to its various advantages. The technology does not require any sample preparation and is non-contacting and non-destructive. The spectra are acquired quickly and can be analyzed through glass or a polymer packaging, and not interfered by water. Raman spectroscopy is highly used in the pharmaceutical industry for analysis of salt forms and polymorphs.